Need help with computer timing out. Goes to sleep (black screen) on me if I look away for a minute or go for a walk. Wasn't doing it a week ago. I have changed power options to never and back to 60 mins etc. Watched a couple of YouTube vids, done a hack and it is still doing it. I went to the windows page but you have to register there to ask a question! I think my pc updated again a couple days ago because when I went to shut it down I only had the option of 'update and shut down' so I put it on hibernate. (I figure it updated during the day while on hibernate because the option is not there any more). Someone mentioned to stop windows from forcing updates on you. How do I do that? Any way I assume it is my OS that is the problem not my computer? The button in the bottom left corner used to be called Start. Doesn't seem to have a name anymore. Brings up a screen like attached. Adjust here. In addition, the computer manufacturer may have their own settings. For example, a Dell computer may have their own Power & Sleep settings. 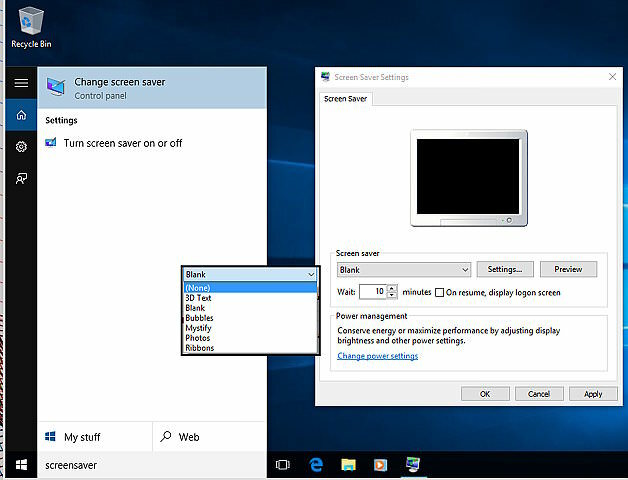 Check if there is any form of settings / set up for your computer. Mine is just like it. I have all mine on 5 hrs. This set up is for a lap top though. Mine is a desktop. Anyhow I had it all set up and everything was working fine. Just had a look and I have had 3 updates this month. 2 Adobe Flash and 1 windows. Do you know how I can stop updates, or at least be asked first? Quote: ...Goes to sleep (black screen) on me if I look away for a minute or go for a walk..
Quote: ..Do you know how I can stop updates, or at least be asked first?.. Not a Windows user anymore. looks complicated. (06-16-2018, 01:23 PM)sallyanne Wrote: Do you know how I can stop updates, or at least be asked first? Microsoft don't recommend this, so they have not provided a quick access method. Best to leave it as is. As Rich said, it can be done. But this is only recommended for users who know what they are doing and have a good reason to turn off auto updates. (06-16-2018, 10:17 AM)sallyanne Wrote: Goes to sleep (black screen) on me if I look away for a minute or go for a walk. Wasn't doing it a week ago. I have changed power options to never and back to 60 mins etc. Watched a couple of YouTube vids, done a hack and it is still doing it. Many things can happen in Windows, including malware. Do you have some kind of antivirus running? Any unexpected CPU or disk activity? One thing you can do is boot a Live USB disk of some Linux distro and see if the same thing happens then (and perhaps you'll discover that Linux isn't that bad and keep it . I'll have a look Rich. I'm sure I turned Screen saver off. EDIT: Was on none but under that it had 1 minute before and I had ticked display log in screen on resume. I have changed that to 30 minutes and time 3d text for screensaver. I know microsoft doesn't 'recommend' it. must be a way though. Everything is ok at the moment now. Even though I had the screen saver on none, the 1 minute setting must have still been in effect.